Ivan Willard Conrad was J. Edgar Hoover's loyalist at the Federal Bureau of Investigation crime laboratory and could be counted on to do Hoover's bidding. Hoover had a 48-year career with the FBI and created a national police force during his years as director. Conrad was employed at the laboratory from 1934 until his 1973 retirement following Hoover's death. Hoover relied on men like Conrad to carry out his orders…even when the orders violated the law. Conrad, like the other members of Hoover's ruling inner circle, knew of the illegal and ruthless behavior under Operation COINTELPRO. After years of chasing Communist spies and mafia gangsters, Hoover turned his attention to domestic political activity in the mid-60's and ordered agents to "disrupt" the Black Panthers and other "black nationalist" groups. COINTELPRO tactics of "no holds barred" ferocity were diverse, unethical, and often illegal. One of the COINTELPRO weapons was false convictions. Conrad was brought into a COINTELPRO conspiracy to convict two targets of the clandestine operation, the leaders of the Omaha, Nebraska affiliate of the Black Panthers called the Nebraska Committee to Combat Fascism. The case involved the bombing murder of patrolman Larry Minard, a 29-year old father of five, who was instantly killed while examining a suitcase in a vacant building. Minard and seven other officers had been lured to the lethal booby-trap by an emergency call to the police hotline about a woman screaming. It was the tape recording of the deadly call, the voice of a killer, that posed a stumbling block to the conviction of the two Panther leaders, Ed Poindexter and Mondo we Langa (then David Rice). The Omaha Special-Agent-in-Charge made an offer to Asst. Chief of Police Glen W. Gates the day of the bombing to examine the tape for clues at the national crime laboratory. Gates, who headed the investigation into Minard's murder, agreed to an informal, oral report from the Omaha FBI office rather than a formal, forensic analysis that would have to be disclosed at trial. 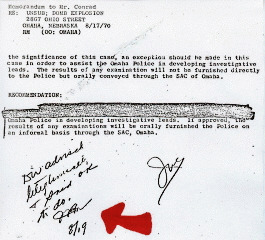 When Conrad got the COINTELPRO memo from the Omaha Field Office recommending the withholding of a lab report on the tape recording he talked with Hoover by phone and noted the FBI director's answer in a scrawled notation on the memo, "Dir advised telephonically & said OK to do." Conrad then initialed and dated the memo entry. Gates later sent another memo to Hoover, by way of the Omaha FBI office, asking that no use of the tape be made because it might be "prejudicial to the police murder trial" of Poindexter and Langa. For Gates and Hoover, the conviction of the two Panther leaders was more important than the actual identity of Minard's killers. Conrad kept his mouth shut, Ed Poindexter and Mondo we Langa never had benefit of the tape recording for their defense. The jury that convicted the two men never heard the voice of the man who called police into the fatal ambush. Both men are serving life sentences at the Nebraska State Penitentiary and deny any involvement in Minard's death. Hoover died in May 1972 and several investigations conducted in the following years have provided a partial picture of the scope of deceptions of the COINTELPRO operatives. The Church Committee of the U.S. Senate examined some aspects of COINTELPRO and issued a damning report on the operation. Separately, financial irregularities emerged that pointed to Hoover and his ruling directorate that led to investigation by Attorney General Griffin Bell. In January 1978, the U.S. Department of Justice issued a formal report on the United States Recording Company scandal that managed to snare Conrad. Conrad, a ham radio buff, had been taking electronic equipment for years and stocked his home with $20,000 worth of gadgets and equipment. According to the final report by Attorney General Bell, Conrad could not be prosecuted for the removal of equipment from the lab. "Mr. Conrad took many pieces of electronic recording and amplifying equipment home with him and used them for his own benefit. Mr. Conrad asserted he had the equipment for legitimate purposes. The Department recovered all the equipment, and Mr. Conrad tendered a $1,500 cashier's check to pay for his use of the equipment." The Justice Dept. report continued: "No further action has been taken against Mr. Conrad. Prosecution was barred, in the judgement [sic] of the Criminal Division, by the statute of limitations and because of the lack of evidence showing criminal intent on the part of Mr. Conrad." While Conrad was able to escape prosecution, the 'Omaha Two' have been languishing in prison unable to get attention to the unjust trial that convicted them. A 15-year old, Duane Peak, confessed to the killing of Minard but said Poindexter and Langa helped him. Peak also claimed to have made the call that Conrad withheld a report about. The voice on the tape does not sound like a 15-year old. Eventually local authorities destroyed the original tape recording but in 1980 a copy made by a police dispatcher emerged. Although Langa appealed about the tape, it had not been subjected to independent vocal analysis and his case was denied. In 2006, Poindexter was able to have the tape examined by vocal expert Tom Owen and it was determined that Peak did not make the murderous phone call leaving an unidentified killer on the loose. Poindexter has a new trial request pending before the Nebraska Supreme Court. Oral argument is scheduled for October. No date for a decision has been announced.